The way we observe graffiti is usually within the realm of their street presence – they are “street art” and a category that remains an underground cryptic form of messaging from the communities inside-out. 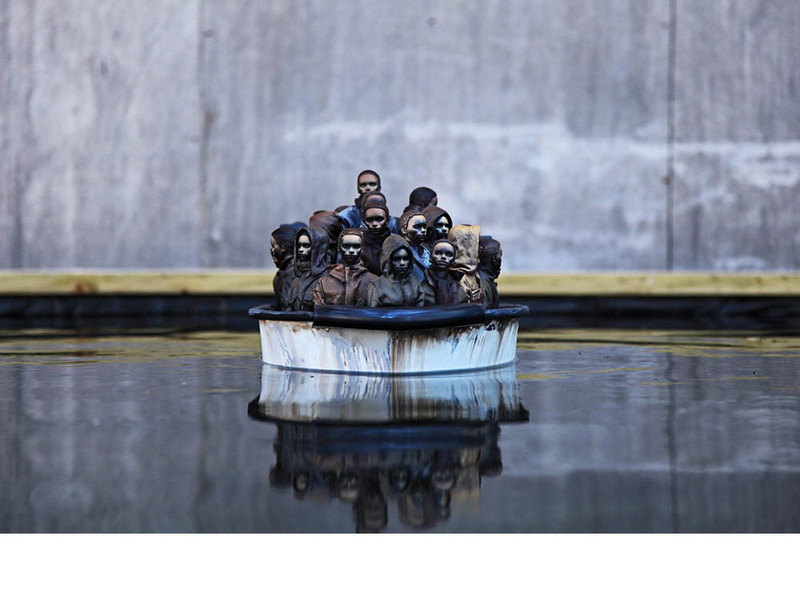 With Banksy’s worldwide recognition, the high-art has started to take notice. But that did not change the nature of the satirical, critical, political nature of graffiti (and the image of the graffiti artist as well). There are a few rather intriguing things I find in the way the street art is functions. Analysing these will be important for my own work with Woods.Live light graffiti. In the movie Exit Through the Gift Shop (1), one of the artists interviewed has pointed out that street art is not made to last. It is there for a while. It may be painted over at any given time. And they are ok with that. Contrary to the politics of private ownership and possession of things – the graffiti is like a cloud of messages passing by you for a while ready to disappear at any time. No one owns it. Although, of course, they have tried to sell the pieces of walls with Banksy on it. It was not made to stay. It is not made to be sold. And that is ok. Even if it is a hotel. Or a sad entertainment park. Graffiti that we are observing here are a form of rebellion. Although Netflix and Converse are heavily engaged in painting walls around Shoreditch, the street art culture is a bit more difficult to commodify. With the exception of a few “famous names”, one of the most popular among them is actually completely anonymous. As it appeared in the conversations with Rachel Falconer, art imposed on the street is a form of “tender violence” specifically referring to my idea of the “light graffiti” to be thrown to various walls around the city. It is vulnerable in its delivery (one can get caught) and it is also dancing on a thin line of not being taken seriously (or being just a meme). It is also open to be bought, owned or devoured by the current system that appropriates disobedience rendering it useless. One of the most expensive things in the largely data-controlled society is being invisible, anonymous, mistaken. Putting the strong message as being more important then the author(s) does help with the burden of “expectation” but it also opens this small space to navigate unseen. I am interested in an image that can tell a thousand new images. In the work “Stop. Listen” I have also explored the option of using sound to create images in your mind. The visual part was narrowed down on purpose. It cannot be scrolled or shown as just a video. You have to be there to experience it. This is another holy grail to aspire to – being there for the “real experience”(2) is a very unique opportunity to have in the mobile mediated unrealities. I have even asked participants to close their eyes while navigating the “Stop. Listen” and let the live recorded sound create the images in their minds. Graffiti is like an unwanted child of the “great classical art”. The established flirt with it, but remain out of it. It is also community-based. It flourishes in the times of revolutions. It is a way the cities are trying to tell us something. It is media art in its essence by giving a “voice” to otherwise silent walls, hallways, buildings, roads. It is like a map of non-conforming. Like a barometer pointing out what is ill in the society. A form of meaningful vandalism where the form is not saturated with flaky meaning and still can be a powerful transmitter. (1) Exit Through The Gift Shop, 2010, directed by Banksy, starring Mr.BrainWash. (2) Debord, G. (1967), Society of the Spectacle, [online] theanarchistlibrary.org, accessed March 27th, 2018.